50″ discharge height, 45° discharge angle. 90″ wide open pour chute tapered to a 65″ wide discharge opening. 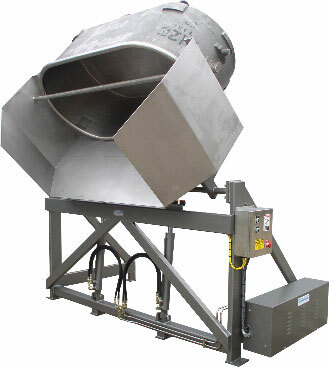 Loading skip includes forks that accept the dough trough manually rolled in at floor level. Washdown duty carbon steel tubular construction with continuous welds. Totally self contained 2 GPM Barnes hydraulic pumping unit with Parker hydraulic valving. Includes timed auto pivot control feature. IFM Efector proximity switches with quick disconnect cord sets.